In electricity delivery systems, whether integrated or open to competition, solar and wind power are dispatched before conventional energies due to their low generation cost. The result is a change to the wholesale price of electricity that tends to modify the composition of the overall electricity mix. The electricity mix consists of the accumulation of power plants using varied technologies to transform primary energies into electrical power. At any given time, the only power plants used are those whose operating costs are lower than what consumers are willing to pay, meaning lower than the price where there is a competitive market. The others are kept on hold to meet any increase in demand (or a shortfall from one of the active power plants). The merit order is therefore determined solely by operating cost, essentially meaning the sum of the costs of primary energy (coal, natural gas, oil and nuclear fuel) and the price of greenhouse gas emissions permits. But for a power plant to be candidate for generation, the expected income must cover all its costs. Therefore, the difference between the market price and the operating cost must at least cover the cost of the installed capacity. Otherwise, the power plant is no longer profitable. It exits the electricity mix. An installed power plant can be forced out of the market due to an increase in its costs (for example, a substantial increase in the costs of emissions permits) and / or a decrease in the price of electricity such as that caused by large volumes of electrical power generated by renewable sources. But what happens when the wind drops and the sun sets? To understand how the electricity generated by photovoltaic panels affects the output of conventional power plants, let us turn to the Californian duck whose flight path has been already crossed in a previous post, here. Its shape represents changes in electricity consumption net off the contribution from solar power on a typical day in California. Our web-footed friend illustrates the dual effect of the development of solar power on the generation of traditional energies: i) the duck's stomach shows that conventional power plants need to wind down every day as the sun climbs towards its zenith, before gradually increasing their output to compensate as the sun sinks in the sky and finally sets; ii) the duck's neck is there to remind us that if peak consumption occurs at the end of the day, it coincides with the decline in output of solar panels; the uptake of conventional power generation sources must therefore be achieved in a very short period of time, which requires great flexibility in the replacement power plants. The development of solar power, combined with an increase in the demand for electricity, modifies the shape of the duck: over the years, its stomach grows rounder while its neck stretches. We might therefore suspect that the consequences are not the same for all technologies. How can a duck with a bigger stomach and a longer neck affect electricity prices? On average, where there is substantial generation from renewable sources, particularly solar power, we see a drop in the prevailing rates. But this average decrease hides a more complex daily effect. 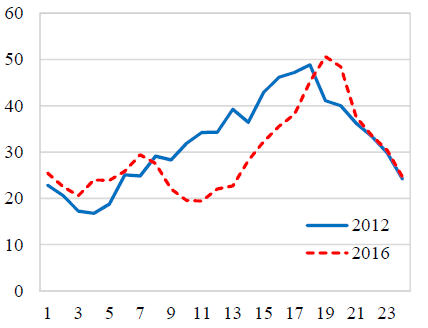 For California between 2012 and 2016, J. Busnell and K. Novan have demonstrated a substantial decrease in the middle of the day, preceded and followed by an increase at times without sunlight, fluctuations that are attributable to the significant investments made in the big photovoltaic installations that sell their output directly on the wholesale markets. What is the effect on the electricity mix? The effect of the lower daylight hour prices on the profitability of power plants depends on their length of use and their ability to modulate their output. So-called base-load power plants are characterised by very high fixed costs and low operating costs. They generate almost continuously throughout the 8,760 hours of the year, except during periods of maintenance. This is the case for nuclear power stations in France. In California, apart from nuclear and hydro-electric power, it is gas-fired combined cycle power plants (CCPP) that supply base- load demand. Whenever it is necessary to supply power for short periods, low investment, high operating cost power plants are used. In California, these are gas turbines and steam turbines. For the same installed base, it follows that the injection of large quantities of photovoltaic electricity during the day should result in a decrease in the output of CCPPs, but leave that of gas and steam turbines unchanged. But that is where the duck's neck comes in: to respond to increased demand at times when photovoltaic supplies decline and then disappear, you must either be very flexible, meaning being able to ramp up output very rapidly, or remain active during times of off-peak demand. But, CCPPs are replaced by solar power for daytime distribution and they do not have the flexibility needed to rapidly replace it at the end of the day. Combined cycle plants are also therefore replaced at the end of the day, this time by gas and steam turbines that are more flexible but also emit more CO2 and have higher operating costs. As it is the marginal generation facilities that determine market prices, rates go up in the evening. To sum up, the development of photovoltaic solar plants has two effects on the electricity mix: a positive effect, the reduction of the expensive and polluting daytime generation by CCPPs and a negative effect, which is the increase in the even more expensive and polluting nocturnal generation from gas and steam turbines. Due to intermittent supply, wind and solar power are both substitutes for and complementary to conventional sources of electricity generation. They compete with those conventional sources when the sun shines and the wind blows. At these times, the renewable sources have a structural advantage that ensures they are first choice in the order of priority. But when sun and wind are lacking, they are replaced by conventional sources. To do so flexible technologies are needed whose profitability can be ensured by operating over only a small part of the year. This means we must either accept that wholesale prices rise when these plants take over from renewable sources, or we have to subsidize their production capacity. The energy transition has only just begun. The penetration of subsidised intermittent renewable energies means that we must rethink how conventional energies are paid for so that they can provide a complementary source of electricity. Until the day when, perhaps, storage systems will make it possible to meet the evening demand with the energy generated during the day by renewable sources. In other words, put the duck on a diet to wring its neck! Between 2012 and 2016, the average amount of solar power generated between midday and 1 pm grew from 640 MWh to more than 6400 MWh. The CCPPs are thermal plants in which a first turbine is driven by gases produced by the combustion of gas at high temperature, then a second turbine is driven by the steam produced by the heat from the combustion of the gases.